Make the sauce by simmering frozen wild blueberries with maple syrup, vanilla, nutmeg and cinnamon until it thickens, about 15 minutes. Place one tsp wild blueberry sauce in the bottom of each cup. Trim the skin off the brie cheese and place one tsp of the brie into each cup on top of the wild blueberry sauce. Bake for 12-15 minutes until pastry is golden brown (or follow package directions). 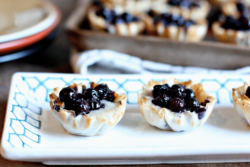 Remove from oven and sprinkle each cup with thawed wild blueberries.